I know, I am supposed to have a photo for Wordless Wednesday. I decided to not do Wordless Wednesday today. I may do Thirsty Thursday or Frustrated Friday this week..who knows. Quick question: how do you know when it is time to replace the little smell good thingy in your fridge? Quick answer: when you open the refrigerator door and smell onions....when you have no onions! There's your TMI for the day! So I mentioned the other day there would be some fun and games (and some other boring stuff) while we are waiting on me to finish my inspiration/idea board. I'm working on it....just slowly. There have been some hiccups with the closing (surprise, surprise it has been pushed out 2 weeks), so I've been distracted with trying to get some things together. ...until 1940, when she died at the age of 96. Quite impressive. 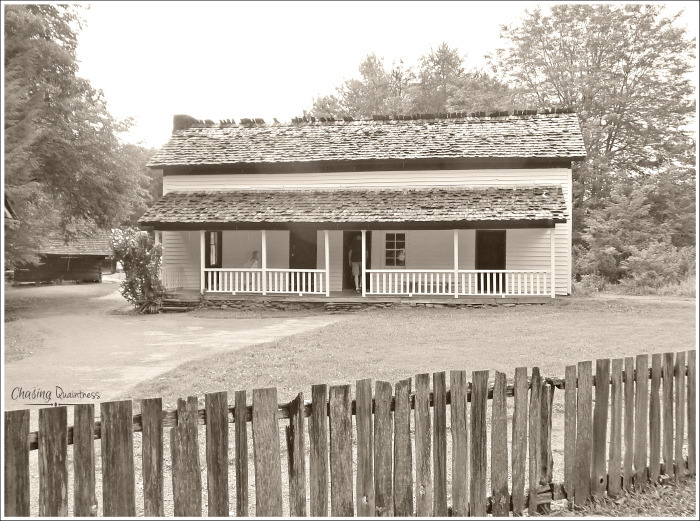 A little side note...you will notice there is no vandalous graffiti in her house...it is across from the gift shop. Do you know what this is on the walls boys and girls? Anyone?...anyone?.....good ol' shiplap! Chip and Joanna Gaines most favorite wall material! They would have a great time fixing up this house...which is what we are going to do...just virtually. 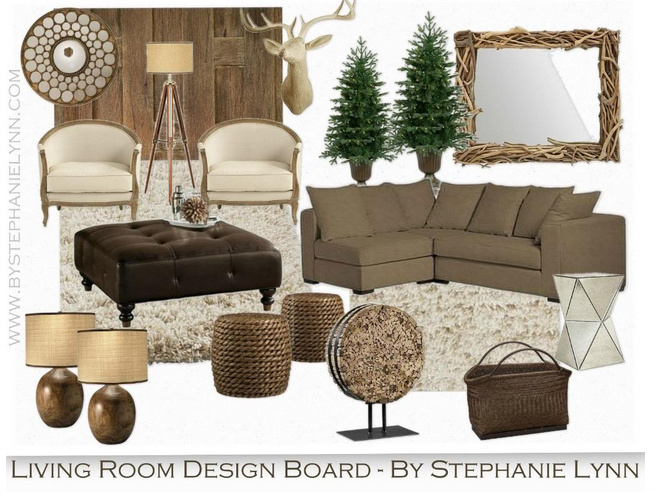 I found this Mood Board over at By Stephanie Lynn's blog and thought it might be appropriate for this room. What do you think? I could definitely see some of these items in the room. I would use the map of the US over the sofa, center that deer head above the fireplace, find a few more trinkets for the mantel...maybe even a stick or two. ;-) OR, put the mirror above the fireplace and the deer head on that skinny wall by the door. Those cake stands would be great in the kitchen or on the ottoman on a tray. I would put the crates outside by the front door, turned upside down, so that I could sit my pumpkins, scarecrows and other fall decor on top of and around them. OR I might rig them up to catch us some possum and squirrel for dinner....yum, yum! Instead of placing that rug under the ottoman/coffee table, I would put it closer to the fireplace....that is until it burned and then I would throw it in the yard. Now that I've given you some ideas and a head start, where would you place these items in the room? 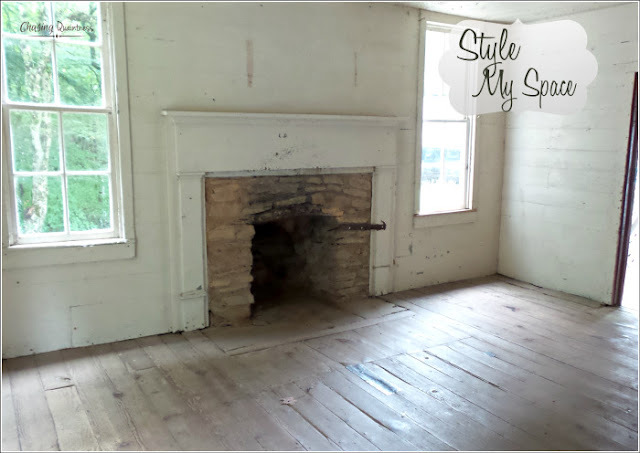 Love the old shiplap and the floors of the house! My grandma is still going strong at 96 and I am very lucky for that! Love the inspiration too. That is so awesome that you still have your grandmother...both of mine are gone and have been for many years. :-( The walls and floors are pretty darn awesome in this house! This was a fun idea Benita! 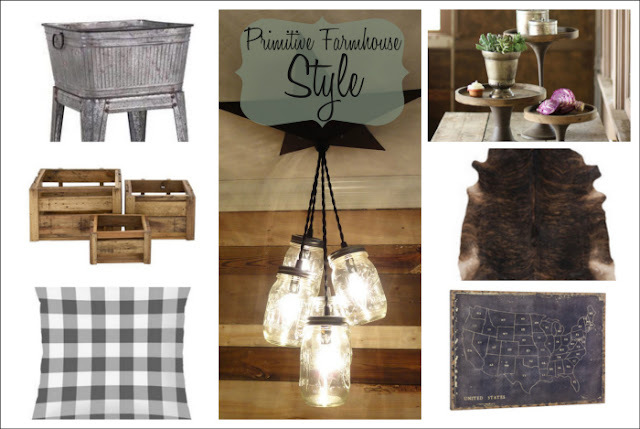 Love the mason jar lights and the three round side table collection is wonderful. I wouldn't mind those in my house. Sorry, I can't see anything except those cake plates. I have a secret weakness and a not so secret addiction. I have never seen ones like those, though, and now Ia m completely obsessed. Off to shop!! I love those cake plates also and have been trying to decide about buying them. They are so versatile and can be styled perfectly for every season!! I think I found them on Dot & Bo. LOL...you are too funny! The tables are those things that look like rope drums and a kite...I thought those were the 3 tables you were referring to..LOL. I LOVE Aunt Becky's house, seriously love it. I would hang that map of the USA somewhere for sure. Could I bring my red leather Ethan Allen sofa for it and an old red leather bank chair? And then for once in my life I'd go minimalist and have lots of space around and on everything. You know I'm going to be furnishing that house in my mind tonight instead of sleeping, right? i can see i'm going to have to add another favorite to my blog list! and there are already too many!!! and NOW i know just who you are benita! you met with dewena in person. how wonderful was that! oh lordy. too many exclamation points here. i'm gushing like an oil well. it's late. heading to the midnight hour. Awww, thank you so much! I’m glad you are enjoying what you’ve read. And yes ma’am, Dewena and I met for lunch a few weeks ago. I just love her so! We had such a marvelous time chatting about everything under the sun!! We hope to get the hubster’s together soon. We are in the middle of closing on a house and trying to get moved, but I hope we do it before the move and I want to have them over for dinner after we move! I love that buffalo check pillow and will definitely be incorporating a few of them in the new space. I don't like the cowhide rug either, but love the other fluffy rugs. And like you, I've warmed up to the antler things...does that make me trendy? ;-) The cake plates are fabulous!!! Girl, that pin board will make your head spin...I've pinned so much stuff and I really need to narrow some things down. The hubster told the builder today during our walk-through that I watched too much HGTV and proceeded to tell him all the changes I wanted to make. I started to tell him that HGTV had nothing to do with it, that it was Pinterest giving me all the ideas!! Thanks so much! Hugs!! I adore your Aunt Becky's house, with its shiplap and wonderful bones. Your ideas are perfect! I love both design boards the colors are extremely inviting. Think I would add a little natural green and feel right at home. I agree Carole, a little natural greenery would be the icing on the cake! I love your Aunt Becky's house it is amazing - Thanks for linking up to Pin Worthy Wednesday, I have pinned your post to the Pin Worthy Wednesday Pinterest Board. Thanks so much Amber! And thank you all for hosting each week! Have a great evening!